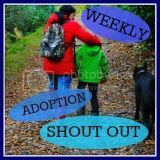 This blog links up with #WASO - the Weekly Adoption Shout Out. Like all adopters, when going through the process towards approval, we had to show that we had a good support network. On paper ours was excellent: family, close friends, other friends, adopters, work-related people, social services, neighbours. The reality has been, well, different. Some friends have disappeared, some people who I thought would call regularly haven't called once to see how we are. It was rather like when my Dad died - lots of people immediately expressed their sorrow, their care, their sadness but then went quiet on me - in fact one friend never called and when I later asked him why, he said that he didn't know what to say. Maybe that's it, people don't know what to say to us, think they're intruding, think we'll be too busy. I don't know. I don't think it's just up to us to be constantly updating people is it? Of course, we have had some wonderful support. My mum has been brill and one mum at school has been so lovely (the only mum who knows); adopters who live locally; social services have been very good too (yes, really), spending lots of time with us in the early days listening, offering suggestions and arranging theraplay and one of my best friends has been so supportive. But I think one of the biggest areas of support are from people I've never met, may never meet or even know their real names and that's the online community. Through Twitter, the blogging community and The Adoption Social website, I've linked up with other adopters, shared problems, shared positive moments, shared advice, cried, laughed and compared chocolate binges. These are the mums and dads who completely understand how we feel, who have children with similar behaviours and just 'get it'. Even when I'm stuck indoors, not wanting to leave the sofa, I know I can log on to Twitter and find someone to chat with, someone in the same shoes as me and then I don't feel so isolated. Blimey, how on earth would I have coped without social media! In other news, I wasn't successful in the London Marathon ballot <breathes sigh of relief>. Once again, Daddy, me and Missy will cheer from the sidelines. 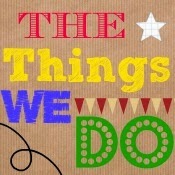 Firstly, do you like the new colour of the blog? I like the autumnal feel and the slight quirkyness of it. Today we had a review meeting with the Theraplay therapist just to discuss how the summer had gone and to decide if we need more sessions. Daddy came too. I emailed her in the week with a summary of the two months since we'd last had a session and discussed one or two points such as her food issue, anger management and her relationship with Daddy (which I think is brilliant). The therapist felt that her attachment to Daddy was much quicker than me because she had had experience of a chaotic birth mum, so wasn't sure what I'd be like and therefore tested me a lot, whereas she'd never experienced a father figure before and so just assume that how Daddy acted was right. I hadn't looked at it from that point of view before. Daddy isn't still sure he feels like a Daddy yet, he says he feels like a Guardian, but that's a step forward from a few months ago. I think he makes a great Daddy. The post adoption support social worker was there too and both asked us if there was any more support we needed. I feel like we've reached a plateau at the moment but feel that when Missy turns 8/9, at the age when cognition is greater, that she may need to return for some sessions. Before we put in the adoption order we wanted to make sure that this support would still be available post adoption. I must have asked several times and each time they assured me it would still be available which is very comforting to know. So, for now, weekly Theraplay sessions have stopped until such time we feel we need them again. In other news, and it's a whopper really, Daddy has decided to resign from his job. A risk yes, but we'll take it. For any prospective adopters reading this blog, if you are in a couple and one or both of you work on a rota basis, think very hard about your work situation. Daddy currently works five days in seven, always has to be in on a Saturday and most Sundays. Working at weekends doesn't mix when you adopt a child who goes to school. When Daddy isn't working he sees Missy in the morning, and then again 3.30pm til 7pm. We can't go out for family days out and Daddy is too knackered from work on his days off to want to do much. Daddy has been very stressed lately and it all came to a head this week. I'm fully supportive and we have enough in the bank to keep us comfortable for a while whilst Daddy looks for a Monday to Friday job. He has a fantastic work ethic and will work bloody hard during the week, it's just that working at weekends doesn't work for us as adopters. And we'll get a proper Christmas, hurrah! Daddy's always had to work Christmas Eve and is usually back in work on Boxing Day or the day after. I think it can only strengthen the family unit as there is soooooo much we can do all together at weekends. We told the therapist and the post adoption support worker yesterday and they also felt it will be very good for us. Right, time to go to the hospital for Missy's appointment with the eye consultant. Oh joy. Do you know, they charge £3.50 for parking?! Out-flippin-rageous. The start of the September term still feels to me like a new year, even years after finishing school. I often re-evaluate what I'm doing, start new projects, even more so than on 1st January. This year is no different yet it's very different. Actually, as they say in Vietnam "Same, same but different". I gave up work a year ago as requested by the social workers so I could devote all my time to looking after Missy. Back in April I desperately needed to find a focus to help me out of my depression and I turned back to one of my roles which is a home-based business. Unfortunately, something unpleasant relating to that business completely threw me off balance 6 weeks ago, so much so that I'm not sure if I want to continue. It's left a bad taste in my mouth and I don't have the energy to fight it. Yet it might be good for me in the long run. I was reading Green Parent magazine this weekend and, what with the change in seasons, I'm feeling a connection back to what I think in my heart I'm truly about which is related to holistic health and trying to be more green than the average person in the street. One friend described me as an 'earth mother' type. Not how I'd describe me but I quite liked that. However please don't get the image of flowers in hair and flowy skirts; I do like Costa Coffee and flying long-haul (that said, I did bag a bargain flowy skirt for a £1 in the local charity shop yesterday). I do have things in my hair although it's more than likely some decoration that Missy has fashioned out of paper. Though come to think of it, she did put a twig of thyme from the garden in my hair last week. Ha, maybe I am earth mother after all! Anyway, I'm going to start looking at how I can fit what I want to do around Missy's school hours - I still definitely need to be there for her after school. I've also signed up to a course teaching children how to meditate with a view to doing this in schools. Somewhere along the line, I'd love to utilise my skills specifically to help children with trauma but this probably won't be for a few years. Going back to the hairdressing, it's one thing that seems to help Missy relax and regulate. She would do it for hours in my hair and I'm happy to let her. I've also introduced her to meditation using a CD which we play after she's had her bedtime story and isn't too tired already. She loves it and often requests it and I definitely noticed a difference in her behaviour when I started using it. Hence why I want to learn it. My own relaxation comes from reading a good book or magazine, baking, giving myself reiki or, on a sunny day, just sitting in the garden (obviously mostly activities I do when Missy is at school). Vegging in front of the tv is also high on the list particularly if its a cooking programme. I love running too although haven't done much this year but I intend to start again regularly next week. If I'm feeling flushed I might even treat myself to a massage. I also LOVE Bowen therapy and have just come back from having a treatment to help a back and shoulder problem. I love relaxing; it's hugely important and one thing I would tell my clients over and over was to make time for themselves. Sod the dusting! Chilling out and being good to yourself is key to good health and less stress and boy do us adopters have stress! Right, where's the five foot pile of magazines I need to catch up on? Back to school - and an Award! Whilst the holidays were more enjoyable than I was expecting, I was truly glad when last Tuesday came around and Missy returned to school. My Facebook timeline was full of mums posting tearful messages and photos of their darlings in their uniform on their first days back. Of course, I can't post photos. I also didn't feel tearful. Thankfully, the one Mum at school who knows about Missy was also hugely relieved and not at all sad the holidays were over so we were both glad that someone else felt the same and didn't feel so guilty. Missy has had mixed emotions about going back to school. Throughout the summer, if asked, she's been very proud to announce that she's starting in Year 1 this term. To her, this means she's a big girl now. Depending on when you asked her, she was either looking forward to going back to school or not. She wasn't sure about having less playtime and more learning numbers and letters. Actually, going on what the teacher said last term, she won't notice the gentle transition they put in place from Reception to Year 1. The first few weeks is still very much child-led play-based, moving gently on to teacher-led work. In the few days before going back to school there wasn't much change in Missy's behaviour. Bedtime was a little earlier than it had been during the holidays and we talked lots about seeing her friends and the teachers. Tuesday morning there were no tantrums or tears as expected and as soon as she got to the playground she was straight back into playing with friends, like they hadn't been apart for 6 weeks. What we have noticed is that even for Missy who is always on the go, these last four days back at school have been exhausting for her. Last night she was almost falling asleep before she'd had her meal and this morning she was very unsettled, wanting lots of hugs and reassurance. She wanted to stay at home all day with Daddy and me, but again once when we got to school she was fine. Very early night tonight methinks. The wetting has started again though (sigh). Throughout the holidays I think she only wet a couple of times and I thought we'd got past it. Missy even said to me without prompting that she wasn't going to wet herself as she was in Year 1 now. But yesterday, as she came out of school with a plastic bag in had, I knew she'd wet herself again. At least this time she'd told a teacher who got her changed into fresh knickers. Still haven't got this one sussed yet. Actually, it seems Missy's first week back has gone very well indeed - whilst writing this post, Missy has come in from school having been awarded the school's UNICEF Rights & Respect Award for her year for settling back into school so well and learning the class routines. How cool! Well done Missy. And no wet knickers either. Hurrah! We made it through the school holidays relatively unscathed. Missy went back to school yesterday and whilst she was a little unhappy in the middle of the night, on arrival at the playground she settled back in straight away and was happy to see her chums. I was happy to go home to some peace and quiet. On the whole the holidays were fine if not a little exhausting on the attention front. Missy seemed to enjoy all the activities we did and only had a handful of small tantrums. She is going through a stage at the moment though where if she gets upset or frustrated she will cry that she's missing her 'old mummy' or that she doesn't want to live here anymore. When she's calmed down from her tantrum she usually says that she didn't mean what she said. However, it's still something I shall mention at the review with the Theraplay therapist in a few weeks time. Control is still something Missy wants. Several years of being in control is not going to be changed by a few months living with us. Having spent all this time with Missy, I've learnt a few more ways to calm the situation and not let my anxiety levels rise too much. Partly I ignore her. Not completely. I do take notice of her issue, what's troubling her, how she is reacting, but I've learnt that sometimes letting her work out her issue and regulate herself whilst I explain that I'll be, for example, downstairs or in the kitchen when she is ready for a cuddle, is the way to go. I don't get into a debate or argument with her, I make my point and then shut up eg whyyyy do I have to clean my teeth - first time I'll say 'to keep them healthy' but the next time I'll just be quiet - she usually goes and cleans her teeth or does whatever she's supposed to then. There are some things I won't tolerate though if she carries on, such as rudeness, hitting or chatback. Saying that, she hasn't hit much recently, maybe 2 or 3 times in the last 6 weeks and they were out of frustration. On the whole she is a different girl from the girl who arrived 10 months ago - still bloody exhausting and demanding attention - but so many of our initial issues have gone or reduced considerably. I've no idea if we're doing the right parenting, the correct therapeutic parenting, the PC way of parenting but I think on the whole we're doing an ok job. I even printed out the Adoption Order paperwork! I've started to fill it in but currently it's sat on the desk. We're not quite there yet. Daddy expressed some wobbles the other day and something is holding me back but I don't know what. But at least we're considering the paperwork and that's a positive move. Right, I'm off to make the most of the glorious sunshine and the peace and quiet for an hour before the school run.